While I was browsing the courses on Udemy, I saw this. This course is eligible for SkillsFuture credits and the only SkillsFuture I know of is our local Singapore scheme for subsidizing training credits. I wanted to be sure so I went to the SkillsFuture site to countercheck. Too me quite a while to find course directory though, but yes, confirmed that Udemy courses are indeed eligible for SkillsFuture. Simply put, the Singapore goverment has allocated SGD $500 to every Singapore above the age of 25 for upgrading and learning new skills. This $500 can be carried over to the subsequent year(s) if unutilized and will be topped up by the Government from time to time. 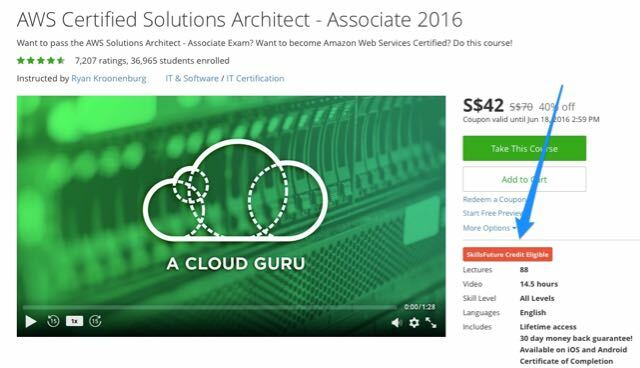 So besides learning skills that are relevant to your daily job, this $500 could be used for courses that teaches you new skills and knowledge. Art and music, basically financial accounting etc etc. The last time I checked the Skills Future site was when it was just launched. I didn’t find anything suitable then and thought it might be redundant for me. The course directoty was launched subsequently and I’m impressed by the number of courses listed. This is the link to the course directory : https://portal.wda.gov.sg/content/wda/course-search-directory.html?TrainingProvider=udemy. Besides Udemy, Coursera courses are also eligible. Just search for Coursera under “Training Provider“. I’m pleasantly surprised because I was expecting WDA to only qualify local training providers that are classroom based. That would mean that the $500 SGD credit would not be sufficient for longer courses. There are many courses on Udemy and Coursera, covering various disciplines like accounting, computing, art, music etc. There might be something else you want to learn besides the skills you need for your daily job. Since the Singapore goverment pays for it, why not?